A catchment area is a hydrological unit. Each drop of precipitation that falls into a catchment area eventually ends up in the same river going to the sea if it doesn’t evaporate. However, it can take a very long time. Catchment areas are separated from each other by watersheds. 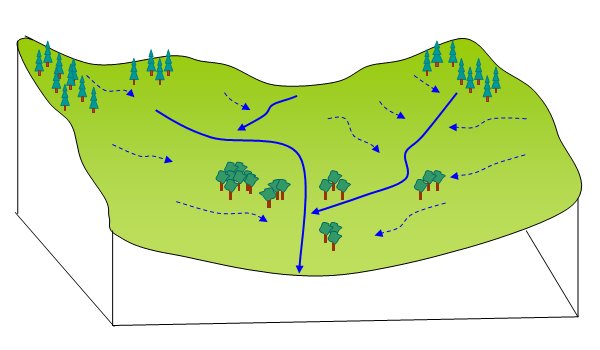 A watershed is natural division line along the highest points in an area. Catchments are divided into sub catchments, also along the lines of elevation. The drawing shows a theoretical catchment area with flow paths of precipitation.